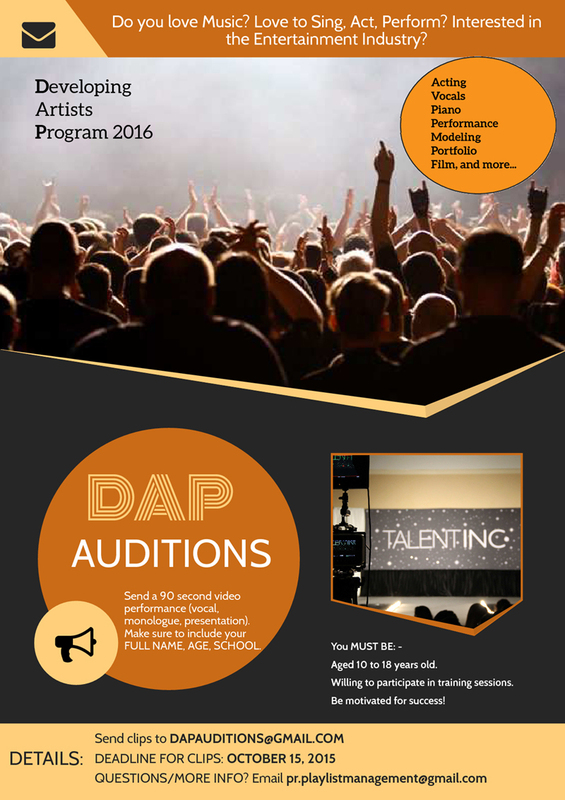 PlayList kicks off their Developing Artists Program [DAP] 2016 with their online video submission audition call. PlayList is looking for young, talented artists to participate in the program which is designed to cultivate talent, provide growth opportunities and a glimpse into the life of an artist. To expose young artists/entertainers to training, locally and overseas with specialized instruction conducted by professionals working in the industry. To further enhance their performance skills, as well as to encourage their love for the arts. To provide networking opportunities to further enhance their ability, their careers, and ultimately our community as a whole. Performers are asked to submit their 90 second video [vocal, monologue or presentation] to dapauditions@gmail.com – including their name, age and school. The video can be informal – cell phone videos are acceptable. Deadline for submissions is Thursday, October 15th, 2015. Contact pr.playlistmanagement@gmail.com for any questions or concerns.